The Abacos, Bahamas - The story of the little national park that was, but wasn’t and then was. Confused? So were we! Watch the video to get the whole story on one of the most creative ways a national park has been created. Marine resources and The Bahamas in integrally linked. Fowl Cay is a national park and marine reserve.. or is it? Gregory Town, Eleuthera - Why can’t we find no pineapples?? 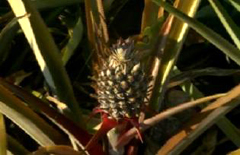 No, not them Costa Rican ones-we mean fresh Bahamian “Sugar Loaf” pineapples? ConchSaladTV investigates. Clearly we still need clues. Or one clue would be good. Drop off what you know in the comments section so we can follow up. Paradise Island, The Bahamas - The 2011 Women's Empowerment Summit was held on April 27th at Atlantis and under the theme, "Embrace Your Power" and delivered inspiration, encouragement, and hope; along with acknowledging achievements made by women in the local arena as well as the Caribbean. The Bahamas Weekly News Team was on hand to bring you this video interview with international motivational speaker and writer, Lisa Nichols, one of the teachers in the book and movie, "The Secret", and a collaborative author of two "Chicken Soup" series. The Bahamas Weekly News Team was on hand to bring you interviews from women who spoke at the Summit. NEW HAMPSHIRE - While attending a business expo luncheon, Donald Trump reacts to news that he won a trip to the Bahamas, after purchasing a hundred dollars worth of raffle tickets. The purchase was made with a hundred dollar bill at the Greater Nashua Chamber of Commerce business expo Wednesday, May 11, 2011. The money went to support the Chamber. Watch the video as Trump hands a hundred dollar bill and returns 15 minutes later to find out he's won a two-night stay in The Bahamas. Come along with Sarah and watch as crawfish (Bahamian lobster) are speared, cleaned, cooked and served at a Party in Da Backyard. Enjoy the views of the beautiful Bahamas reefs in the underwater scenes! Watch as Sarah catches several crawfish, and a huge one in particular; then shows you how to make a stuffed crawfish - yum! 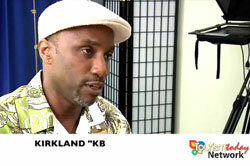 Nassau, Bahamas - Musician, songwriter and recording artists, Kirkland KB Bodie recently released a new single, I Hook on Facebook. Listen to KB as he is interviewed by the Tourism Today team during a recording session where the favourite entertainer gave a Public Service Announcement on the importance of registering to vote. 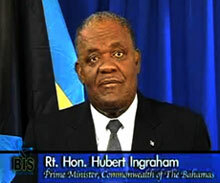 Nassau, Bahamas - The following is a National Address by the Rt Hon Hubert A Ingraham, Prime Minister of the Commonwealth of The Bahamas: New Providence Transformation and Modernization delivered on April 25th, 2011. Freeport, Grand Bahama Island - Sarah Nuru, who was named Germany's Next Topmodel in 2009, was in Grand Bahama Island in early April where she was a surprise guest on a top model competition visiting from Germany, as well as corresponding for the entertainment show Red! on ProSieben TV. Nassau, Bahamas - The new Bahamian website Conch Salad TV is now featuring, Fowl Cay: The Diving Experience. Freeport, The Bahamas - On March 17th, Canadian R & B singer/songwriter , Jully Black (pronounced ‘Julie’) delivered a powerful and passionate performance to the delight of the locals and tourists gathered at the Port Lucaya Marketplace in Grand Bahama, making it her first performance in the Caribbean. Freeport, Grand Bahama Island - The Bahamas Weekly is pleased to present the official Grand Bahama Flash Mob video, produced by Mackey Media ltd with the assistance of Lyndah Wells, Mark Winder, Rico Thompson, Lisa Davis, Nicole Leblanc, Frankie Ladéyo, Catherine Macleay, Karen Clarke, Marcus Bethel, David Mackey and Nicholas Rolle on cameras. A group of over 100 persons from all walks of life, ranging from children to grandparents, and who had been practicing for only 4 weeks under the direction of local Grand Bahamian choreography, Julion Collie on a 3 minute dance routine starting with one person and building to the full group. Their grand performance took place Thursday, March 17th at The Port Lucaya Market Place amidst an enthusiastic crowd of on lookers, some of which opted to participate. The Bahamas Weekly News Team was on hand with cameras rolling and snapping when The Grand Bahama Performing Arts Society hosted its third annual comedy show March 11th and 12th 2011. This video contains highlights from their trip to Grand Bahama Island including their limo arrival to the event and a couple comedic antics from each comedian. A rich and varied mix of comedy was provided by the three visiting headliners: Gina Brillon..., Kyle Grooms, and Big Daddy Tazz. MCing the event was local funnyman Trevor Russell along with American comedian Ricardo Aleman who each year assists in lining up the high caliber entertainment. "I had a great time. This was our best year, and it will keep getting better! said Aleman. Freeport, Grand Bahama Island - They may be gone, but they will never be forgotten! Up with People's 100 cast members, from 21 countries visited Grand Bahama from February 19th to the 24th to learn about the local culture, provide collectively over 2000 hours of community service, and put on a performance that for those that attended will never forget! They close beaches for their nests in the US, but in The Bahamas Piping Plovers are just on vacation. Birding guide Ricky Johnson takes us on a search for these teeny-tiny birds. And we’re not the only ones looking for them. The Bahamas National Trust and volunteers from the National Audubon Society were counting them on our beaches this winter to find out how many were here. The video is brought to you by Abaco Nature Tours, contact Ricky and go see Abaco for yourself! TBW-TV is loaded with over 200 exciting and enlightening videos!! What is TBW TV? It is the one place that you can visit on the web to conveniently view all of the videos produced by your Bahamas Weekly News Team. You will see Interviews with international and local and international actors, entertainers, celebrities, and sports figures, politicians and more. There is something for everyone! "Travel Channel - Ultimate Spring Break" in The Bahamas video features some candid interviews with young Spring Breakers in The Bahamas as they try to explain just what that favourite drink concoction, the Bahama Mama is. Also in this video you will hear some tips on how Spring Breakers handle their consumption while on the carefree vacation in our tropical paradise. The Travel Channel completes the video presentation with all the details on what exactly goes into a Bahama Mama cocktail. You may be surprised just how much alcohol it contains! In this video we take a look at crab catching on Andros, meet the inspiration for the Eddie Minnis song Church Out, Crab Calling, and learn how to make some traditional crab dishes! Most important, we find out how people like their crabbie! 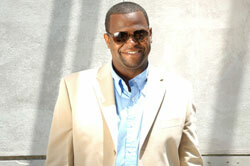 Nassau, Bahamas - Ricardo Clarke's smash hits "Wasting No Time" and "Not Settlin" have topped many of the charts locally and internationally becoming a favorite of many, as it awakens a desire for the absolute best in life. Clarke has just released his official music video for "Not Settlin" (enclosed). On this day in music history, February 23rd, 1965, filming began on The Beatles follow up to A Hard Day’s Night on location in the Bahamas with the working title of Eight Arms to Hold You. View vintage colour video footage the the Fab Four arriving in The Bahamas, with shots of them on the rocky beach, along with their instruments playing "Help". The Beatles are an English rock band, which formed in Liverpool in 1960.